Late August 2012 an international conference was held in Berlin. The objective was to launch and promote an elaborate American project for Syria. “The day after” is based on a long document prepared mostly by the USIP (US Institute for Peace) with various Syrian opposition figures and a number of Europeans. Despite all the apparent non intrusiveness, goodness and neutrality that one is supposed to perceive after reading “US Institute for PEACE” and “Swiss” and “Norwegian” … “facilitators“, this appears to be not much more than another cover for another US State department project that aims to advance US interests regardless of the expected high cost that no one wants to talk about. The USIP’s Steven Heydemann, the “lead facilitator of these efforts” has been a long-time promoter of the inevitability of regime collapse, and a harsh critic of any effort to solve the crisis in Syria through peaceful means. He vilified or ridiculed everyone, from David Ignatius to Kofi Annan, for daring to deviate from Heydemann’s regime-change-is-the-only-option formula. So to ENSURE a successful process all it takes is to work with 45 Syrians who want to topple the regime? It appears that after 18 months of conflict and bloodshed that led to over 20,000 casualties, the United States and its allies in the international community were only able to learn how to better pretend they are a constructive force. 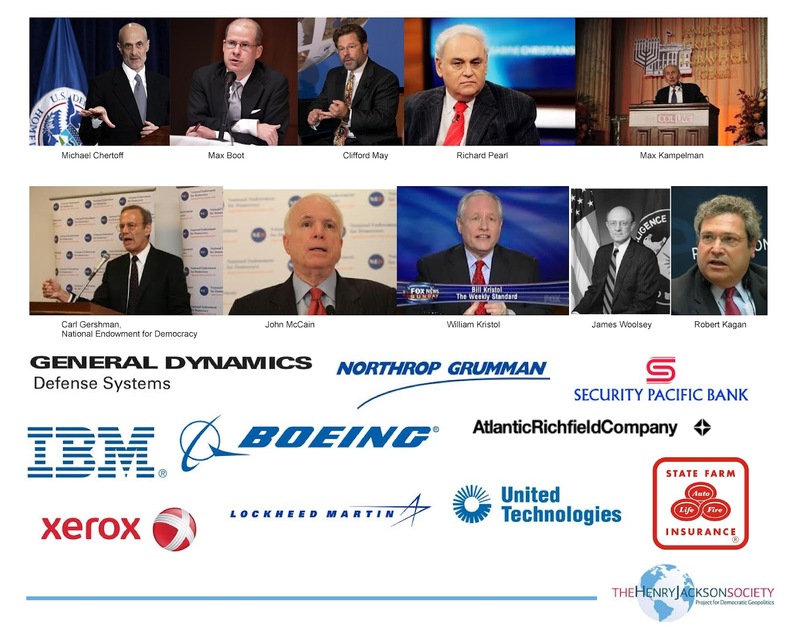 In reality, they still are working exclusively on different tactics that would allow them to defeat a number major segments of the population of Syria in favor of anyone who will help the United States and its allies install a more compliant leadership in Damascus. People are dying in Syria because there is very little learning taking place. For example, to US State Department “the opposition” and specifically US-friendly opposition (for example: Haytham Manaa’s coordination committee not listed), still equals and gets to represent “all major political trends of Syrian society.” They might include religious minorities, women, or secular and liberal Syrians, but they have to join the regime toppling side to be heard by State Department. The millions of Syrians who refuse to create a power vacuum in their country are reduced to “scared minorities” or “Sunni business elites”. In other words; Regime supporters are those selfish Syrians who have their own needs that contradict the ambitions of “the Syrian People” at large that the always caring and helpful United Sates supports. Perhaps the main reason the United States had to weave The Day After’s delicate beautiful cover is that previous, more hawkish, plans for regime change in Syria through the use of a security council authorized NATO force like the one proposed by American think tank “The Henry Jackson Society” proved to be difficult to implement or digest by most parties involved. After a few Russian and Chinese vetoes at the UNSC it was clear that another approach to toppling the regime is needed. If one is to be charitable, one would think of the day after as a potentially useful study by a group of capable individuals that genuinely care about sparing Syria the fate that Iraq suffered due to US decision to remove its regime by force. A more realistic, pessimistic and cynical view would brand it a ploy to attract patriotic opposition and pro regime moderate figures to a regime change project that manages to present itself as an intelligent humanitarian collaborative effort that any Syria lover would be proud to be part of. This makes it easy for many who hesitated so far to commit to regime change without feeling guilty for being now in bed with Syria’s traditional adversaries in “The International Community”. Working on such projects also implies a highly likely future revenue when the regime falls. You can expect consultation fees, reconstruction contracts, or many other potential sources of revenue. This makes many even more committed to regime change as their benefits will be contingent on that possible outcome. The only small detail they don’t tell us is that regime change will be a very long and destructive process that might easily spill outside Syria’s borders. Qaddafi’s army consisted of an estimated 10,000 semi committed not very professional loyalists. Syria’s ideological army and special forces are as large as 250,000 committed professional, well-armed members. “The regime’s” backbone is the army. The Day After hopes to attract dozens of respected opposition members, Syrian army generals (preferably from minorities) as well as government and diplomatic corps defectors and in that way, the regime will somehow collapse as the US and friends can squeeze a week’s worth of propaganda coverage for each defector hoping to continuously demoralize the regime and its supporters. This dream outcome is very unlikely. The Day After will be too late. After a most probable long bloody civil, and perhaps regional, war that might lead to a regime collapse, no one will be able to control Syria. The Swiss, Norwegian and USIP “facilitators” and their full-spectrum Syrian opposition “owners” of the day after report will not pay the price. The Syrian people will. The content of The Day After report is mostly admirable. But until the United States abandons the option of toppling the regime by force, The Day After is nothing more than a fancy psychological warfare recruitment tool. It is NOT too late for dialogue. The dialogue option has never been properly explored. The United States encouraged, and fully expected all Arabs to stick, for long decades, to peaceful options in seeking an end to their conflict with an intransigent, often insincere Likud-ledership of Israel. The same United States gave up on dialogue in Syria after WEEKS, not decades, of the start of the crisis. Those who do not commit to dialogue as the only way to end the crisis will have blood on their hands. There is much more killing waiting to take place for the next few years if you want to wait for and promote the day after. The Day After is more marketing than reality. reminded me of the 2003 “mission accomplished” speech. Syria is descending into Hades quickly and it would take a generation to rebuild. It at least addresses the issue that there was no plan for a post-Saddam Iraq. However, all plans for Syria have to take into consideration all the constituents of the Syrian society. Excellent and well informed, Camille. Yes, TDA is no more than a scam to give ligitmacy to destroying Syria. 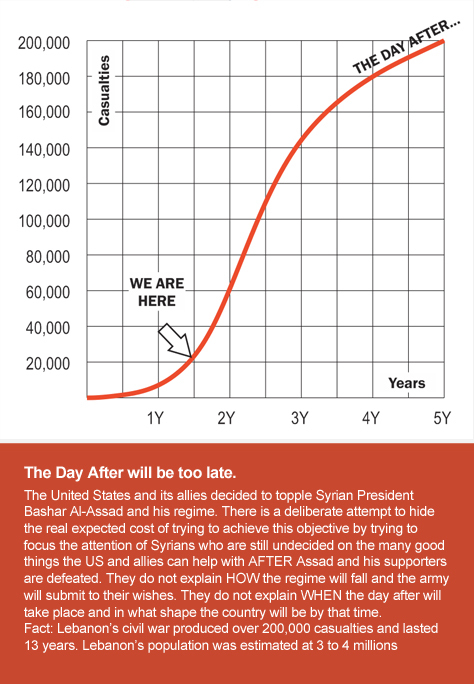 It talks about everything except “how the regime will be toppled”, “how long it will take to do this”, and “what is the cost the Syrians will pay during and after that.”Decent opposition figures should be smart enough not to fall for this. It is one thing to apply quantitative analysis that is based on quantifiable assumptions and clear presuppositions and it is a completely “meaningless” graph to just present a diagram label the axis and pretend that the graph represents anything besides one persons attempt at an interpretation. If the crown jewel of the presentation has no value then I imagine that the rest of the analysis leaves the post in a very vulnerable state. Peaceful resolution is always preferable to non peaceful ones. But if one is to be candid then one must admit that certain constructs cannot be expected to reform themselves and all efforts to argue for keeping what is the real cause of the crisis alive is only a thinly veiled attempt to argue one more time for the preservation of a regime that has no credibility and no legitimacy. I, and many others , have often made the arguments that there is a very easy and quick way to stop the blood shed and the destruction of the Syrian society and that is for Bashar Assad to leave office unconditionally and to put in place a transition government that will introduce and implement free and fair elections supervised by international observers that are open to whoever wishes to stand for office. Any and all political parties are to be welcomed since in a democracy one trusts the people to choose whatever they think is good for them. In a functioning democracy one does not fear the ideology of the winner since those elected will have to deliver on their promises and if they fail to do so then voters will change horses at the next election. The attempt to present those preparing for the inevitability of a regime change as naive and as foreign agents is nothing short of a clear misunderstanding of the dynamics that have created the present quagmire. I am even willing to go further by suggesting that if any party is in denial and is clutching at straws to extend its control then it is the current regime and its supporters. This regime is bankrupt in every single aspect of the word and the only thing that it can do to save the Syrian people some blood and treasure is to agree to the formation of a transition government forthwith. Anything else will be perfidious and unfair. @gkaram Ghassan you made the same argument last time about my use of the bell shaped curve and I explained then and I will explain again now that this is an opinion piece and the graph is clearly a different way of presenting an opinion. It is beyond obvious that I do not have data covering the next three years in the future… I really do not need to explain that part, do i?As to why this is my opinion … think Qaddafi’s 10,000 fighters and Assad’s 25,000 dedicated fighters… think Assad’s regional and international supporters … think about Syria’s neighbors that will with time start suffering similar pain that they are inflicting on Syria …think about how the west is starting to hint at arming “the rebels” with artillery and anti aircraft missiles … and remember that Syria’s population is 5 times larger than Lebanon’s …As for being naive … I don’t think any analyst predicted that happened the past 18 months as well as I did last May 2011 …As for the price that is worth paying for freedom1) You and the other Americans (and the 45 Syrian opposition they used in this project) do not have the right to decide on behalf of the Syrian people2) What freedom? … the rebels are fighting mostly (a majority of them) for a religious state. @CamilleAlexandreOtrakji @gkaram As well as you know we can go back and forth forever but I do not intend to do so. Allow me though to respond to one issue that is mentioned in your comment that demonstrates clearly the reason that we have often a diametrically opposite point of view regarding the current Syrian situation. You say that the rebels are fighting for a religious state. I am not sure that I buy into that but what is important is that even if true and they represent the majority then let them have it. I will not support it but they are entitled to choose whatever they want as long as the decision is arrived at democratically and as long as the right to self expression dissent etc… is guarded. To use an example from Lebanese politics, since you often refer to Lebanon; I will always oppose the philosophy and the teachings of Hezbollah but I am willing to recognize them if they win control of the Parliament and the Cabinet through free elections but when they govern I will be in the opposition. I do believe and rather strongly though that Hezbollah has no rights whatsoever to its military wing. That is non negotiable. As you can see I am suggesting that you accept the opposition . if they win the elections, even though you do not share their views, ; no party in the whole world has ever represented all its population and that is healthy. As a member of the TDA executive and one of the founders of the project I am more than able to address many of the issues that you raise. I will touch on the ones I feel are most pertinent. You are quite right when you say that we, who worked on the TDA are determined to topple the regime. That is why we became involved in the opposition. We are not ashamed of stating this fact out loud. But you are fundamentally wrong in your assumption that the TDA was created for the purpose of toppling the regime. The TDA was created for all Syrians (not just the opposition) to help us see a way forward beyond the the narrow confines and narratives of the Assad regime. The TDA was created as a “living document” that seeks to provide the basis for a vision of a post Assad Syria. You are correct in your assumption that the TDA is part of (a much wider) effort to “… attract patriotic opposition and pro regime moderate figures to a regime change project that manages to present itself as an intelligent humanitarian collaborative effort that any Syria lover would be proud to be part of”. But you are wrong to assume that 45 persons would seek to impose their vision on anyone. The TDA, as I mentioned previously, is a living document aimed at providing options and resources to the Syrian people to help them navigate what is likely to be a very difficult post Assad transition period. It is not a blue print or a road map nor do its authors see a political role for themselves in a post Assad transition period. That is why in part the TDA does not touch on who is to implement its recommendations or how the regime is to be toppled. On the matter of implementation in particular the TDA authors fully understand that they do not have a mandate from the Syrian people to address such issues. I cannot predict how or when a transitional body or government will emerge. As you are well aware the external opposition is highly fragmented and riven with disagreements (even thought we all agree on the core principle of toppling the regime) and the people on the inside are living under the most extreme form of brutalising terror (perpetrated by the regime, I am not going to mince any words here) making it almost impossible to act cohesively. But when such a body eventually emerges it will have a very hard task ahead of it and TDA along with other similar efforts will be there to help guide it. I personally agree with you that the collapse of the regime is going to be long and agonizing for all Syrians. However I strongly disagree with you when you say that the “owners” of the TDA report as you put it will not pay the price. You know almost nothing about us. Many of us have family and friends still inside who are in constant danger from the regime and its cohorts of Shabiha and security forces. A number of the contributors (not named) are still living inside and are prominent well known names in Syria. Not just well known names of the opposition. A number of the contributors who joined our efforts either in person by secretly attending our meetings or on SKYPE continue to live inside (hence the need for secrecy) are prominent businessmen, lawyers, teachers, journalists etc. not known for their open opposition of the regime. Yet they saw fit to participate. This is a Syrian project for Syrians planned by Syrians and the executive committee is entirely Syrian. Yes we accepted assistance from USIP, SWP and others but without such support we could not have marshaled the necessary resources need to complete the task at hand. Finally let me be perfectly blunt with you Camille. You are a regime apologist par excellence. No matter how you spin it, you are covering for a regime that is brutally murdering and torturing its people. There can be no dialogue with the Assads. They must go. Then we can have a national dialogue over how to rebuild our shattered country. Shattered by the heavy artillery, tanks and aircraft of the regime. I am the first to criticise the opposition for its failures and I am not blind to the fact that there are some unpleasant side effects of the militarization of the conflict against Assad (such as the rise of Salafi ideology). But that does not not make up for an excuse to continue to support Bashar Al-Assad and his cronies. Many thanks for taking the time to express your opinion. Outside the Syria crisis (where we differ in our assessments and even some of our aspirations) we probably agree on almost any subject. The crisis created an unfortunate virtual division between us Syrians. My good friends are now split between “traitors” and “supporters of the murderous regime”. Both sides regularly call the others “idiots” (or Donkeys). I will join you in being perfectly blunt… I blame “the Syrian people” for this mess. What you label as “the regime” is a product of “the Syrian people”. The “traitors” and “the Salafists” among you in opposition, are also a product of “The Syrian people”. Those labels are tools in our attempt to see the conflict in utter moral clarity… we are angels, they are evil. @alazmamr Dr. Alazm, thanks for taking the time to clarify a few points regarding TDA project. What is neat in your answer is that it actually reproduces the way TDA authors look at the crisis. You started by talking about a project for all Syrians, and ended by giving Camille a label that is not the least bit flattering, or true. Reason? Because Camille is not one of the “brave Syrians defending freedom and working for a better Syria that starts one “day after” the regime collapses”.The problem with TDA is simply this. It claims to be inclusive, but starts by excluding those who think dialogue is the best way out, not forceful regime toppling. What I find threatening in TDA (as in threatening to Syria, not to me in particular), is that it is very careful in how it is presented, not in what it represents. It is sugar coated, but people who funded it can easily take advantage of it to justify sending weapons to extreme groups and inciting for more sectarian division in our country.In simpler words, the problem with TDA is that it will be used to justify war, but then it will not get a chance to be implemented, and the justification for that will be war. For some reason my comment is not showing under Dr. Alazm’s. Dr.: This is in answer to your comment. Dr. Alazm, thanks for taking the time to clarify a few points regarding TDA project. What is neat in your answer is that it actually reproduces the way TDA authors look at the crisis. You started by talking about a project for all Syrians, and ended by giving Camille a label that is not the least bit flattering, or true. Reason? Because Camille is not one of the “brave Syrians defending freedom and working for a better Syria that starts one “day after” the regime collapses”. The problem with TDA is simply this. It claims to be inclusive, but starts by excluding those who think dialogue is the best way out, not forceful regime toppling. What I find threatening in TDA (as in threatening to Syria, not to me in particular), is that it is very careful in how it is presented, not in what it represents. It is sugar coated, but people who funded it can easily take advantage of it to justify sending weapons to extreme groups and inciting for more sectarian division in our country. In simpler words, the problem with TDA is that it will be used to justify war, but then it will not get a chance to be implemented, and the justification for that will be war. First the TDA as a document does not exclude anyone. It was I who labelled Camille as as a Regime apologist and I was speaking for myself, not on behalf of anyone else. The TDA is what it is, a post Assad vision for Syria, nothing more and nothing less. No conspiracies and no behind the scenes agendas by donors or otherwise and it most certainly does not seek to justify war since the departure of the Assad regime peacefully or violently would still require a post regime plan to reclaim our country back from 40 plus years of tyranny. Second neither I nor those who are like minded (like myself) are against dialogue. On the contrary, we welcome it. But not with the Assads. I will not engage in dialogue to prolong the Assad family hold on Syria. But in a post Assad Syria the country can only and must only be rebuilt through dialogue. Third the forceful toppling of the regime is not a route we chose for ourselves but was imposed on us by the regime itself. let us not kid ourselves over that. The regime’s response to peaceful demonstrations was brutal to the extreme ultimately leading us to where we are today. As for the incitement of sectarianism, that has been a core component of the regime’s narrative from the very beginning and it has worked very hard at inflaming it. This regime is determined to suicidally destroy the entire country and drag us over the sectarian abyss before it gives up. Its up to all of us to stop them before its too late by whatever means available to us. By not participating you are in effect aiding and abetting the regime. Now to the label itself. In our current situation (personal opinion) you are either with the regime and what it stands for, including all its reprehensible actions, the torture, the wanton destruction, the tyranny of 40 years or you are against it. But you cannot be Syrian and claim to be an a neutral observer or that somehow you be with neither side. If you speak out for the regime or try to justify its actions then you are with it and the label stands as accurate. If you are against it then you would not be justifying its actions. I see no third option in this case. I should point out that it is possible to be against the regime and agree that the regime needs to go but disagree on the method. Dialogue can and should be had over the methodology and such heated debates exist with opposition circles and Syria as a whole. In short yes, if you are not somehow working to bring this regime to end by whatever means you feel are appropriate (even if it is by simply withholding your support for it) then in my books the label stands. Camille raises a very good point regarding the fact that it is the fault of the Syrian people that we are where we are today. I agree with you. We are all guilty of this in some part or the other. a regime like this could not have survived all these years without collusion on the part of many of us. Now we reap what the vast majority have sown. For myself I do it so that my children do not have to live through what we had to live through. I find it hard to think of any desirable aspects of the regime that anyone might want to keep. If you are referring to the supposed secular nature of the state (which the Assads shamelessly exploited whilst promoting sectarianism to the extreme) well then I would argue that these are not the exclusive preserve of the regime. I would also want a future post Assad Syria to be of a secular nature too. However you can not really pick and choose your way here. this is not a smorgasbord where you can cherry pick the bits that suit you and disown the parts that dont. This is a take it or leave it as a whole. You either want democracy, dignity, human rights etc… or you want Tyranny, torture and abuse and brutality. I am not guaranteeing that the alternative that will emerge from this mess will necessarily be perfect but I am willing to do my utmost and struggle to achieve that by what ever means are available to me. I am perfectly willing to disagree and respect other Syrians opinions. But in order for Syrians to be able to freely express their opinions and openly debate without fear of repression, imprisonment torture or worse (all hallmarks of this regime) then this regime must go first. How can I talk to the other side when the other side from the first day met peaceful opposition YES peaceful opposition with guns, repression and torture. This regime refused dialogue from day one and followed the security solution. no one is naive here, we all know how that debate went down with people like Butheina Sha’aban, Manaf and others who were supposed to pursue that track!!!!!!!! In short, No dialogue with Assad and his immediate coterie. They must go first then it will be possible to have dialogue in what would be a peaceful dialogue conducive environment. Furthermore the longer they cling to power, the worse it will get and the harder it will be to have the dialogue we all desire. So any actions (including regime apologism) that prolong the regime’s life are in turn contributing to the bloodshed and the collapse of the state (as opposed to the regime) which non of us want. Finally it is interesting that you cite Samir Aita’s piece in support of your argument. Very briefly, we met with Samir shortly before he wrote that piece and we discussed the TDA. The piece he wrote (after the Paris Friends of Syria meeting in July) had everything to do with internal opposition politics and nothing with the TDA. He meant it as a jab against the SNC even though the TDA has nothing to do with the SNC (that was a misunderstanding on Samir’s part which he has since been set straight on). Most importantly he had not even read the TDA since the final document had not been completed. So there is no way for him to judge the content. Anyway that’s another story for another day. As for the questions of who will implement and how etc, well I believe I have already answered these questions in my previous email. The TDA does not implement the strategies, a transitional body/government does, that which the TDA has no part in forming or participating in. In answer to Dr. Alazm. Thanks again Dr. for taking the time to answer our comments. You said: I would engage in dialogue, but not with those in power. I translate: Give me power, then let’s talk about anything you want. “Me” here means the opposition in general. Refusing dialogue with those who you labeled as irrational or not true Syrians just because they refuse to be a part of your project in toppling the regime is basically refusing dialogue altogether. Not to mention that the opposition could not so far manage to have dialogue among themselves. To you, not willing to participate in toppling the regime means you are with the regime and thus with killing, oppression, etc. But it is not like this. Not willing to help THIS OPPOSITION take power is the right term for many people. You basically said: If you don’t help the opposition get the power, you are a criminal. This does not make political sense. The same way, I can say: If you are with the revolution, then you are with the killing (that started two weeks after the first protest with Nidal Jannoud, and continued since then), sectarianism (see this video showing sectarian slogans in week 2 in Jableh, so please don’t give me the regime created this argument: http://www.youtube.com/watch?v=TUu-yGTQW00), with lies and fabrications (see this report for example: http://www.syria-tribune.com/e/index.php/by-syria-tribune/4-under-bonnet) and so on. I can also say I cannot find any reasonable reason why anyone would support this revolution, and then say I would only have dialogue with people who are not involved in this revolution. In other words, with my friends and fans, like you are suggesting.Dialogue happens between opposing parties, and no one should be excluded. Moreover, it is not feasible to refuse dialogue with people who have this much influence and support. You simply can’t, you have no means of excluding them. As for TDA being a justification for war. Sorry, I don’ think the US will ask anyone in the Syrian opposition if it decides to go for direct or indirect war. Your job as opposition is to make sure you don’t give the US the chance to abuse your work. But it seems that many are happy with this abuse. TDA has a great chance of being abused, and a very tiny chance of being implemented. @Ali Moh Again you confuse my personal views with the TDA as a vision of many. The two are not necessarily interchangeable. Furthermore the TDA is not a concensus document but a collection of views. @alazmamr I WAS actually discussing your views. Anyway, I am thankful to Camille for this small window of dialogue that he availed for us. I am against regime toppling, and you still had a discussion or “mini dialogue” with me. It was not that bad, was it? :)On a personal note, I am a huge fan of Dr. Sadik Jalal Al Azm. He is one of the greatest secular minds in the modern Syrian history. It was thanks to his books and some other philosophers that I learned to worry about the unspoken ideology more than the spoken political statements. I am not referring to you, of course, Dr. I am referring to other parties in the Syrian Opposition.Have a great day, Dr.! @Ali Moh Heh heh dialogue with you is not like dialogue with the Assads I hope LOL. On a serious not, of course we need to have dialogue. It was a pleasure communicating and I look forward to future opportunities. @Ali Moh Heh heh dialogue with you is not like dialogue with the Assads I hope LOL. On a serious note, of course we need to have dialogue. It was a pleasure communicating with you and I look forward to future opportunities. @criticalsam criticalsam wants the reader to believe that a genuine leftist would waste any time in supporting dictatorship. Go on dreaming and pretending. @criticalsam @gkaram So you have read Fukuyama, bravo. Where in the world did anyone , on this thread, speak of the end of history and or the Syrian uprising as being nothing else but a first step away from dictatorship and tyranny. And how in the world is pointing out that a genuine “leftist” will never justify and rationalize the current Syrian one party, president for life system is an ad hominem ? But then you are entitled to your own interpretations.